Say hooray for February! Love month means date month! And when we say date, it means jam-packed restaurants! And since it is the love month, Unilab sent me one of their best quality product just in time for the celebration, different flavors of SWISH! Who would want to get caught off guard after a meal with their date, right?! So much for Valentine's date most embarrassing moment. I would definitely bring this later and share it with my hubby for that fresh breath after the meal. Whenever I go and do the grocery I would always get a big bottle for us and a breath spray for each, for me and hubby, that we bring along whenever we're out. And when Unilab generously sent me a Swish gift I gladly shared it with my loved ones. Now, why do I trust Swish so much that I recommend it to my friends and family? It is because, Swish is ALCOHOL-FREE, which made it safe to use every day. It gives you an enjoyable gargling experience without a burning sensation. It is also powered by Surefresh Technology that helps kill bad breath causing bacteria, prevents plaque buildup, gum disease, tooth decay and gingivitis for a guaranteed fresh breath all day! Did I mention that Swish is ready to use? Yup! No need to dilute, so it's practically easy to use. Of all the variants my hubby preferred Cinnamon Blast, while my favorites are Mangosteen Mint and Icy Choco Mint. 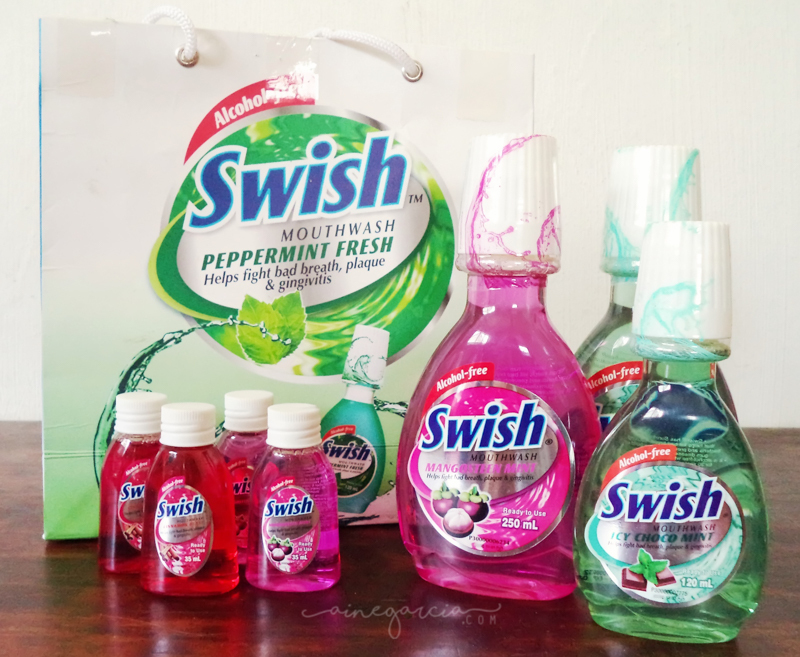 The mint level is just right for me, which is actually an advantage for Swish because they're giving their buyers/consumers a choice to enjoy their mouthwash who prefers gentle to mild level of mint like me. I remember back then, I tried a different mouthwash and was surprised how strong it was that I didn't even finish gargling it because it was too strong for me, that burning/stingy sensation made me really hesitant to use a mouthwash again after that. So I was really thankful that Unilab created Swish with different mint level. Swish Mouthwash is affordable and fits every household's budget. It also comes in 250mL, 120mL, and 35mL bottle. So don't forget to use Swish Mouthwash and get that fresh breath confidence not only on this love month but through out the entire year.